I always thought my dad was the most handsome man in the world. He had a gregarious personality and could talk to a light pole and charm it out of electricity. If he couldn’t do that, he would trade it for something in return for a generous amount. His brothers were the same. There were four boys born to Virgil and Rhoda, handsome boys who knew how to make a buck, hard-working, personable. In the picture above are three of those boys: from the left is Harry, Larry, Granny, and my dad, Churnie. His name was actually Laverne but he couldn’t say that. He would say Lachurn, so that stuck, and he became Churnie forevermore. The fourth brother, called Bub since he was second in line, my dad being first, the little bubby or little brother, moved off to Kentucky, but the others lived and died here in Southern Illinois where they were born, raised, married, and had businesses. 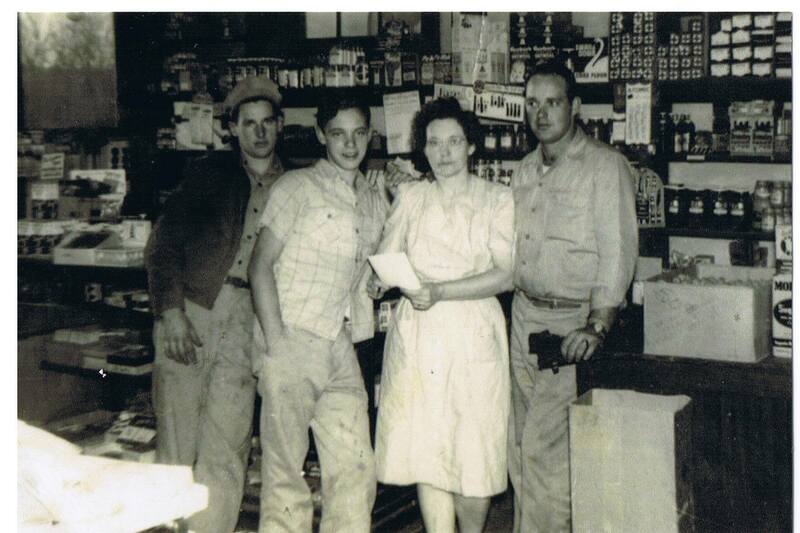 My dad owned and operated a small grocery store, one of those businesses people call a “Mom and Pop” store now. His parents, as can be seen in the above photo, also ran a grocery store. He should have gone to Hollywood. All of them. Those boys were the heart throbs of Hardin County… plus several other counties would be my guess. And I can’t help but think they would have been in L.A. as well. Your dad was always nice to us kids. I remember going out to the farm and riding our horses, esp. through those sand pits. Was fun. He always welcomed us. i still think he should’ve gotten onto Benny Joe though for locking Terry and me in the dog pen!! OHHHHHHHH!! I have wondered all my life why his name was Churnie! Now I know! Very handsome. As he got older, I always kind of thought he looked like Bob Hope. I love old pictures like that. Thanks for posting. We all worked in the grocery store…I learned to use a cash register, count change, slice a pound of lunch meat or cheese, sack groceries, and clean. Every Thursday we all had to be there after school to “put up groceries”, that meant restocking the shelves from what came in on the truck. I would sometimes go with my dad to deliver groceries to peoples houses for people that came in to get groceries, but had no way to get them home. Lots and lots of memories….thanks Bren for stirring those up! Ok, I have no opinion as to their hunkiness, but I’m glad to see that the Rutherfords apparently come from a long line of free market capitalists! Life was so much simplier back then. I sometimes wish we could go back to those good ole’ days! Kids sure appreciated what they had alot more and knew what it was to work and earn some of it themselves. The adults weren’t afraid of a hard days work either! It seemed like families were closer in those days too. I love to hear the old stories and see pictures like this. It does bring a smile to your face. Thanks for sharing. Great picture!! Do you realize what a miracle it is that we are on this earth due to the fact our Dad’s are juvenile diabetics? Dad (Churnie’s baby brother, Larry) was not supposed to live to be 14 or 15 years old.